Your cake is so gorgeous(taller than mine, mine was a midget)!! And that passion fruit curd - that's crazy! I need to find an excuse to make that. Gorgeous cake love that passion fruit curd,very catchy..
Oh man, I'm so jealous you can make passion fruit curd with actual seeds ;p. So pretty! I totally wouldn't be able to stop eating this beautiful treat either. Awesome cake and presentation. Cant wait to bake one for my family and try it...too gud ! 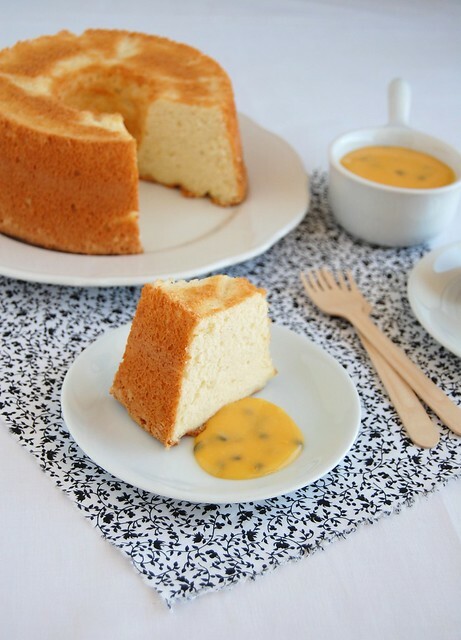 I love any 'curd' (lemon curd/passionfruit curd) with cake. The textures go well together. Great presentation! Yum!!! I love the passion fruit curd! Hi!! First of all I want to tell you that I love this blog!! Congratulations!!! I'm a spanish girl that I recently open a blog and I use a recipe of yours and I want to tell you and I need to know if you are agree or not, and I want to ask you if I can put a link to your blog. If you are agree, can I use more recipes?? Thanks a lot, and kisses from Mallorca (Balearic Islands), Spain.